Vechain has a large amount of fans, and the overseas community is active, the chat atmosphere is relaxed, and there are many discussions related to the project and development. The chats of Chinese community users are usually not related to the project; The frequency of interaction with fans in social channels is not high, but official announcements and event information are timely, and major projects are also disclosed. After the mainnet is online , VeChain has its own block browser, but it does not open the currency address inquiry function. The chip concentration is unknown, but according to the visible transaction information, VET has a considerable transactions. Previously, we observed that they got a total of 45,588 VEN holders from the Etherscan browser. In addition, the top 10 VET currency holding addresses accounted for 55.80% of the total, and the top 100 VET currency holding addresses accounted for 93.82% of the total. Based on the current market circulation rate of 64%, we speculate that VeChain has a relatively high risk of control. At present, the price of VET is $0.0118, and the private sale price is unknown. The ICO price is 1 ETH = 402500 VET, which is about ¥0.005 (2017.8.18–2017.8.21). It has more than doubled the increase so far. According to Coinmarketcap data on October 17, VET is currently ranked 19th in the global cryptocurrency market, and there are 18 online exchanges. The transaction depth is mainly concentrated in Binance and BitMart exchanges. 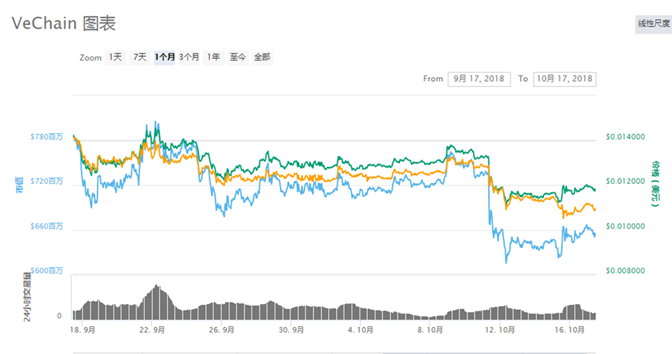 From the performance of the most recent month, the price trend of VET is in a state of falling after the sideways, but there has been a slight rebound in recent days, and the trading volume and price performance are average. On June 30, 2018, the VeChain mainnet was on. On July 9, the VeChain Raytheon wallet was officially launched, basically in line with the white paper’s road map, and strong compliance capabilities. By observing Github, we found that the frequency of code submissions remained at a high level and the technology development was stable. Activities and cooperation, on October 16, 2018, the chain as an ecological initiator and technology provider, providing digital low-carbon ecosystem infrastructure design and basic technical services, and DNV GL (ecological initiator) — as an ecological initiator And third-party agencies to comprehensively review and review the carbon emission reduction process and the carbon credit issuance and circulation process, and cooperate with BYD Auto to sign cooperation. 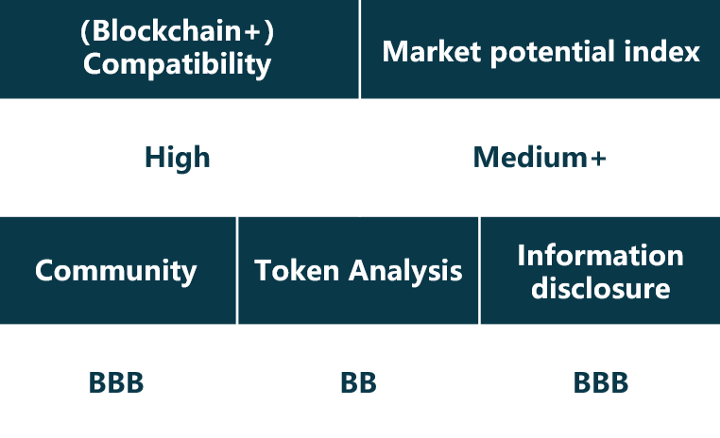 VeChain’s parent company BitSe started earlier, accumulated in blockchain and IoT technology, and can bring B-end user resources to VeChain; the overall transparency of the project is high, and it has cooperated with many manufacturers and has a preliminary landing. Cooperation Case. In terms of traceability, it has been explored in the wine, luxury goods, automobile, agriculture and other industries, and has a preliminary application, which will promote the logistics (including cold chain) in the supply chain and the new relationship between the various entities. The project’s application scenarios have unlimited potential and deserve widespread attention, exciting discussions.